In New York it’s fruit cup season. Well to be honest, they’re sold year round, but you only really notice the awesomeness during the warmer months. We’ve just gotten our first warm patch so I’ve taken note. Fruit cups are available at most every Mom and Pop Bodega. They are usually sold in a couple of varieties: watermelon, honeydew, cantaloupe or mixed fruit ($1.50-$4). Watermelon is generally my favorite because by purchasing it you acknowledge that yes it’s hot out but you can refresh yourself with its sweetness and high water content. 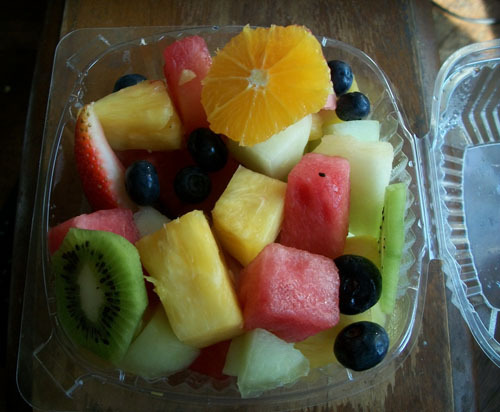 In the mixed fruit packs you’ll usually get some combination of pineapple, honeydew, cantaloupe, and watermelon (big 4) with the other elements varying. They like to include two pieces of kiwi and one piece of orange oftentimes. Getting excited about those is a rookie error. Kiwi fruit is really cool to look at but for some reason the pieces are always too tart. The slice of orange is not terribly good either. The flavors of the honeydew, watermelon and cantaloupe are the stars here. I always appreciate that the juice from the pineapple basically marinates all the other fruit. In the cup pictured since we’re nearing summer the fruit cup we bought included blueberries and strawberries! It’s a fitting dessert for humid and hot days. RoodonFood Tip: It’s important to pick up the fruit cup you’re considering purchasing and give it the 360 degree once-over. Occasionally they’ll sneak in water melon that either isn’t quite ripe or is lighter in color because it’s nearer to the rind. Look for a medium red.